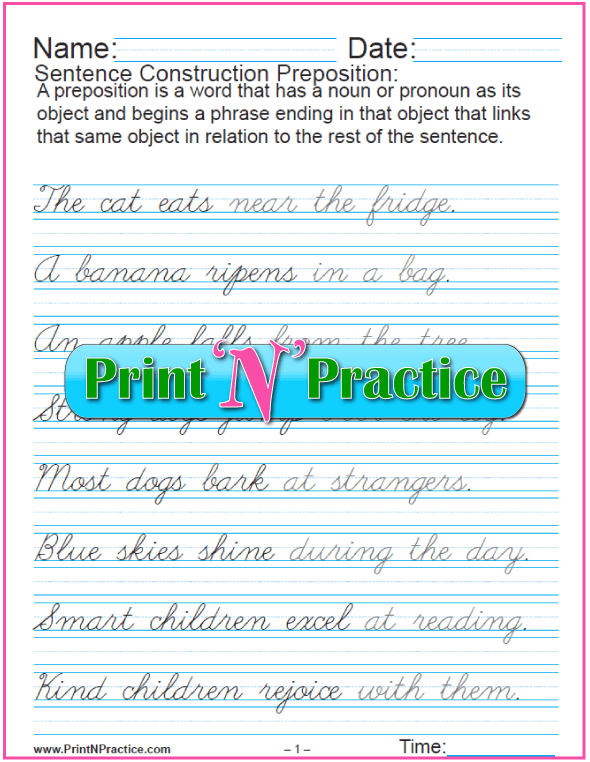 Choose between simple manuscript and cursive sentences for grammar or handwriting. 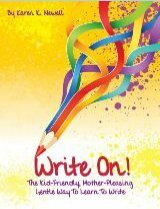 Teach your kids penmanship while teaching grammar, capitalization, and punctuation. By nature, copying a sentence shows that a sentence begins with a capital letter and ends with punctuation. Copying the whole bit is an easy way to practice making complete sentences. 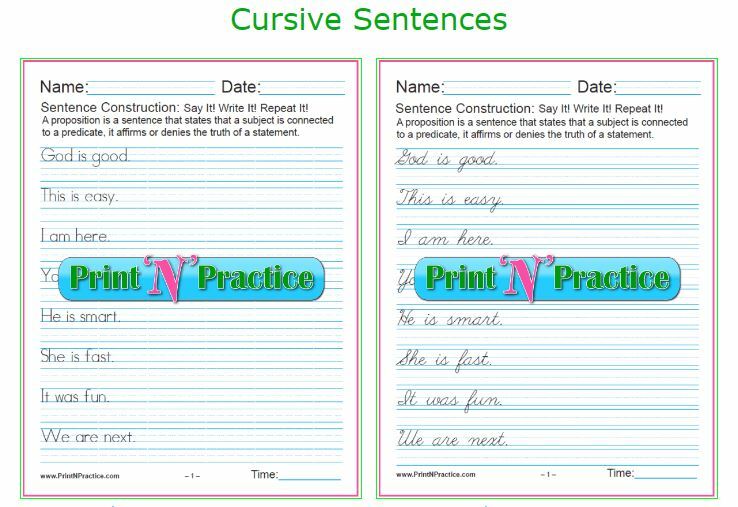 See links to more cursive worksheets below the worksheets. 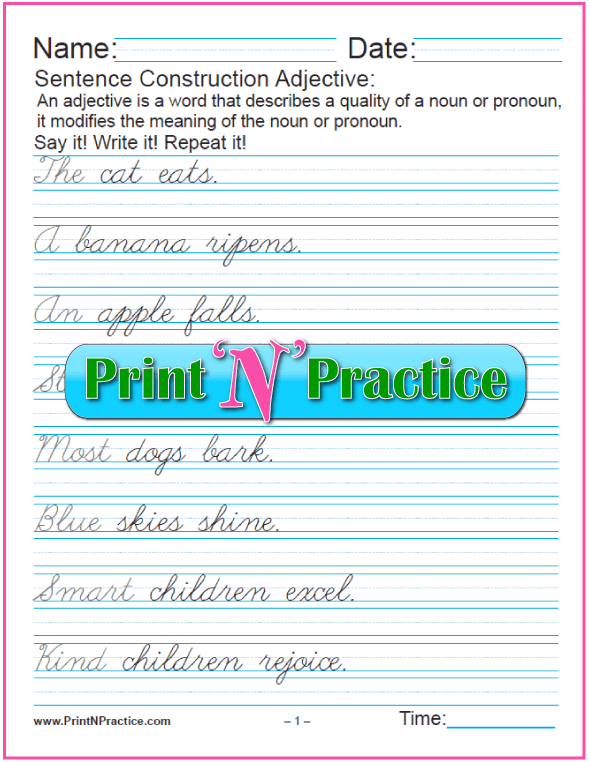 You'll find hundreds of cursive writing worksheets in our grammar worksheets download. They're also great for penmanship practice. 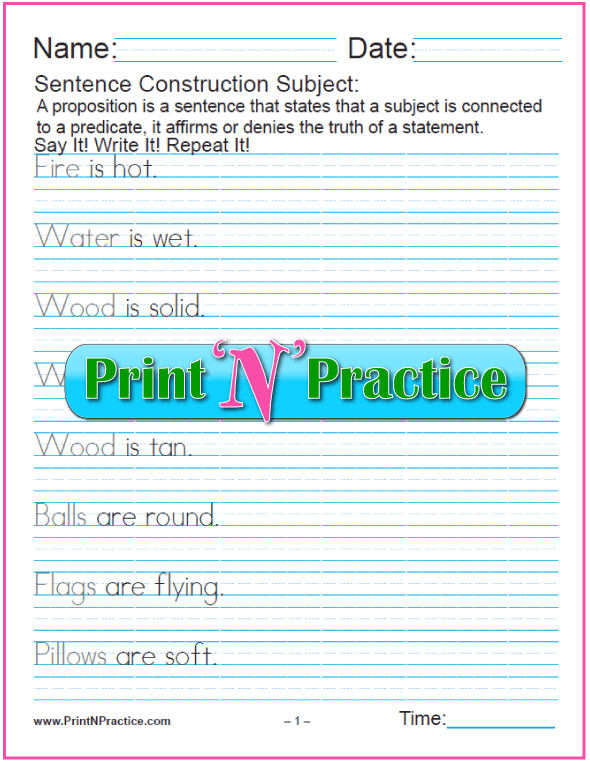 What are statement sentences? A declarative sentence makes a statement, it makes an assertion of being or action, either positive or negative. In a way, "A subject is (to be) or does (action) a verb." Details like adjectives and adverbs transform a sentence by adding details that make the sentence more interesting. On a diagram they are like Christmas ornaments decorating the nouns and verbs. 1. What Is A Simple Sentence With An Action Verb? 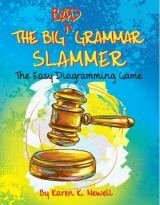 What is a simple sentence? The simplest sentences to make are sentences with action verbs. Short answer: A simple sentence is a statement that has one subject and one verb no matter how many adjectives, adverbs, and phrases it also has. 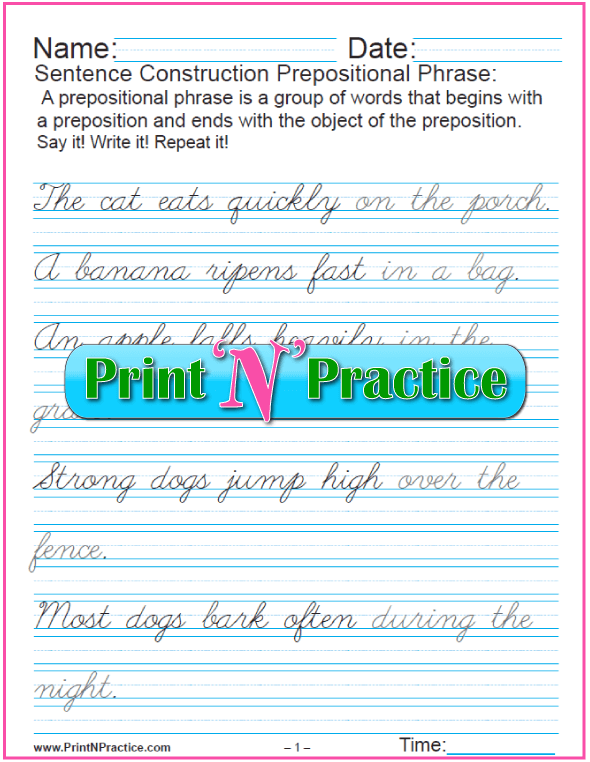 The important point is that there is one subject with one predicate verb. 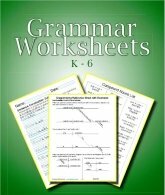 Almost all our grammar worksheets have cursive sentences to complement the manuscript versions. Your choice. A linking verb or state of being verb is like an equal sign. The subject equals the predicate noun, pronoun, or adjective. These are called predicate compliments. 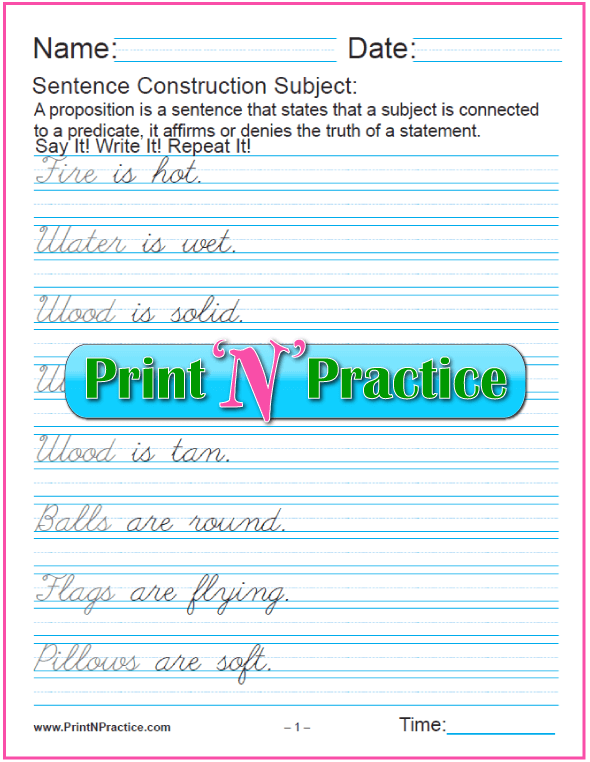 The manuscript sentences are great for younger children and the cursive sentences are great for handwriting practice. Remind your children to use a capital at the beginning and to put the period at the end. Double check. Better, teach them to check their own work. Scan the left side for capitalization and the right side for punctuation. 4. 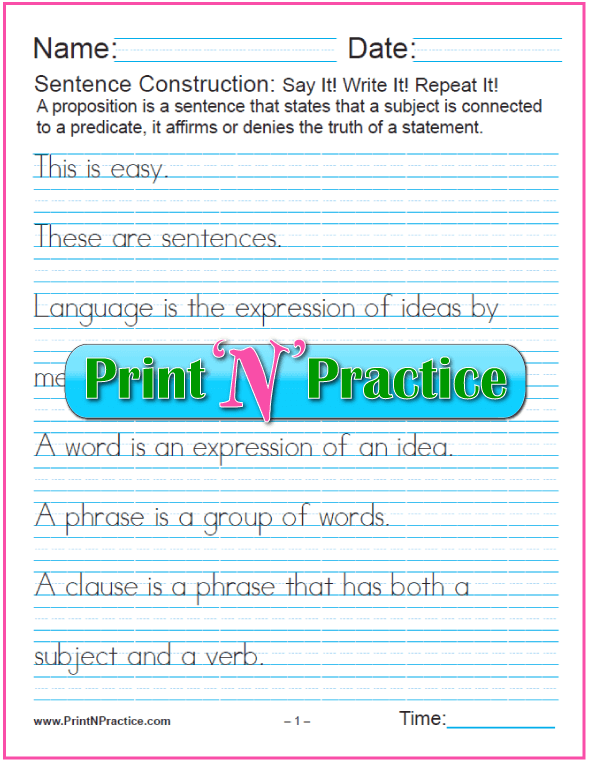 What Is A Simple Sentence Subject? The gray word is the subject in these sentences. 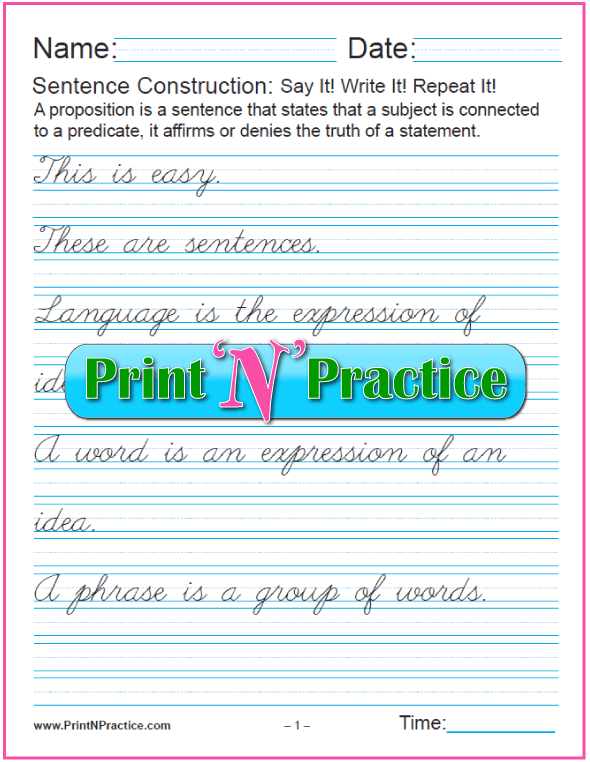 You can even have your children trace over the gray words as you review them in another color to emphasize the part of speech you're teaching. They're more likely to remember it better when they do the copywork. Articles are adjectives. 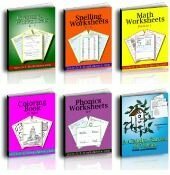 These worksheets show the articles first. You can point out the other adjectives, too. Let the light gray show the difference or have your children trace the grayed words to emphasize where the adjectives are. These are the same as above, yet they teach adverbs. 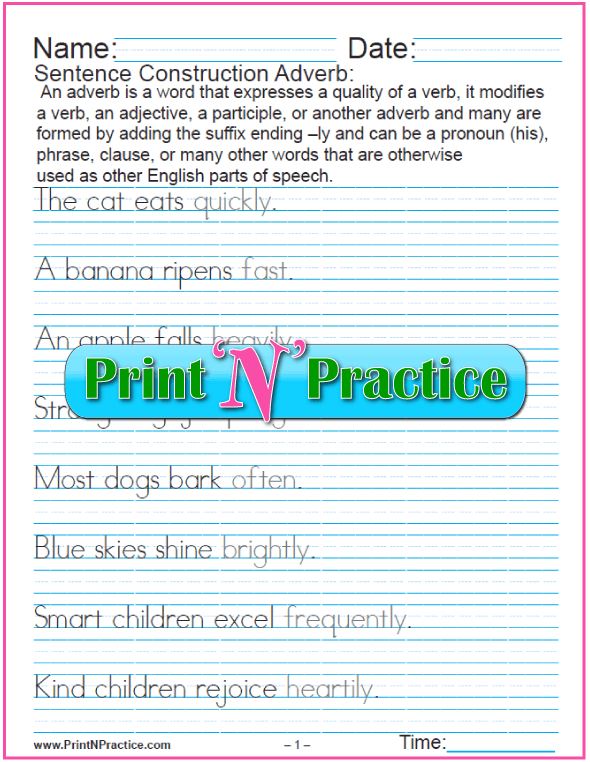 The definition of an adverb is at the top of each worksheet. There are many linking verbs. 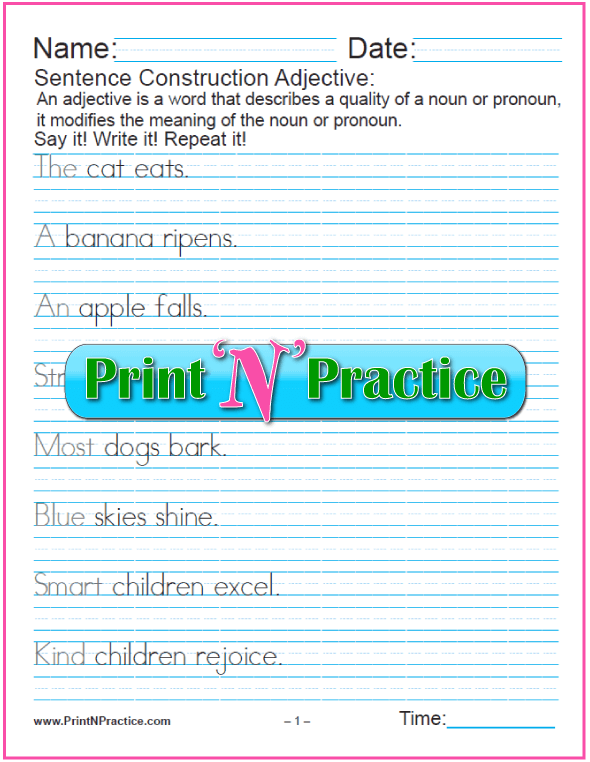 Here is a sample and you can find more in our printable grammar worksheets. The linking verb is in gray. Show that linking verbs are like an equal sign. What's on the left (subject) equals what's on the right (the predicate). 8. What Is A Simple Sentence Predicate? Here the whole predicate phrase is in gray, the verb with the predicate. Here the first gray word is the actual preposition. 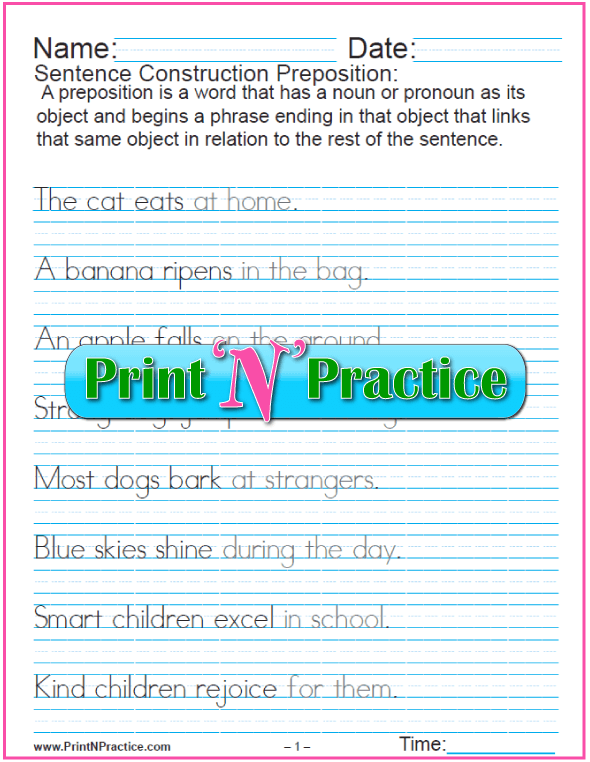 Teach the definition of a preposition and then have your children trace the prepositions in another color before they copy the sentences. 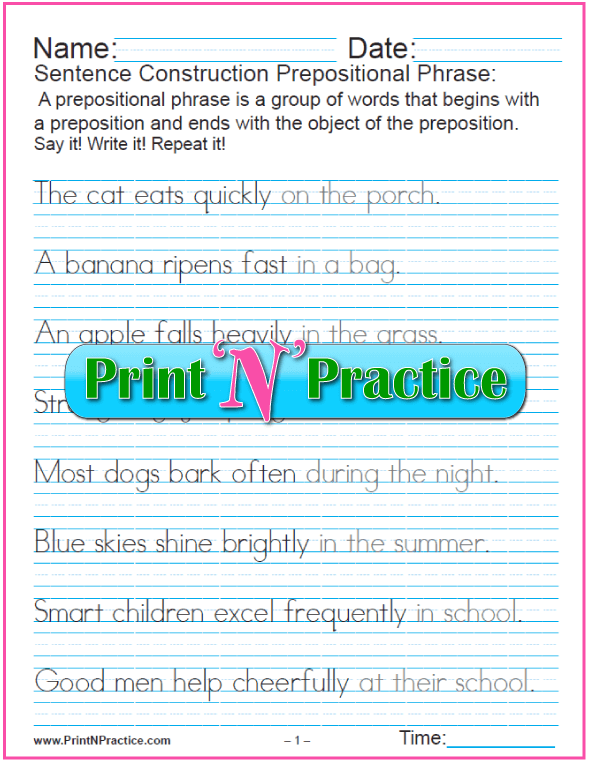 Find a list of prepositions here. 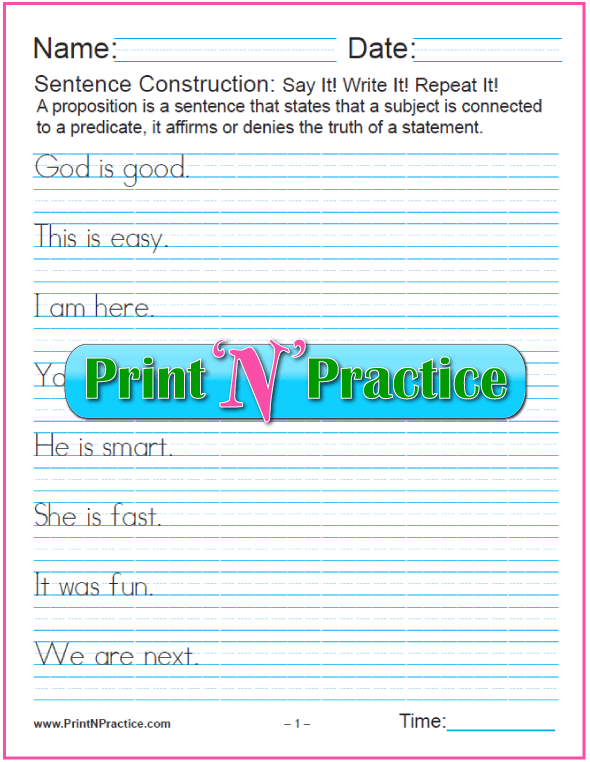 These are similar sentences as in #9, so you can either teach the preposition or the prepositional phrases. See our conjunction worksheets here. You'll find more handwriting worksheets and alphabet worksheets here. 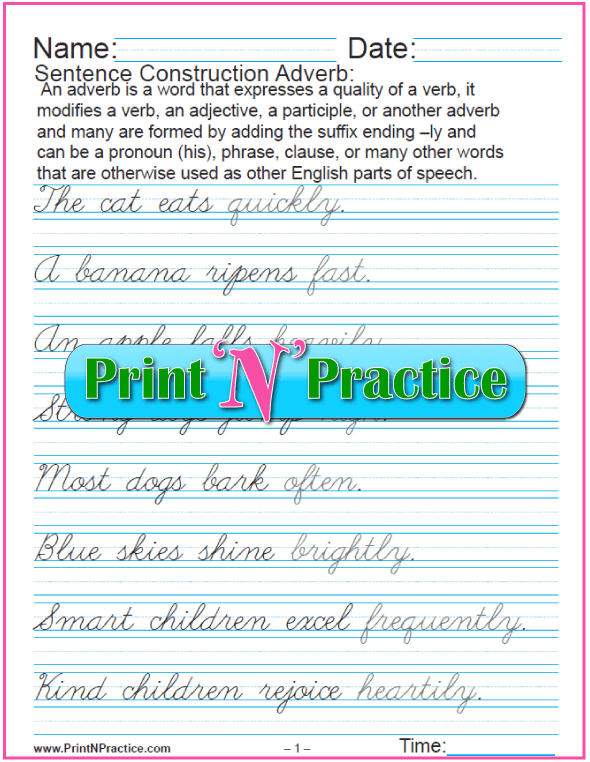 Kids learn grammar and penmanship with cursive sentences: parts of speech, punctuation, and capitals.